Tymon Mellor: In 1904, as the Hong Kong Island tram system was readying for operation, attention focused on the opposite side of the harbour on the development of a tram network for Kowloon. After many false starts, just when it seemed that work was about to start on a Kowloon tram network, the Government had a major change of approach forsaking electric trams for the motor bus with its internal combustion engine. On a visit to Hong Kong in 1901, Mr Dickinson, the owner of Alfred Dickinson & Co, the consultant engineer designing the Hong Kong tram system for the Electric Traction Company of Hong Kong, considered that Kowloon would be an ideal environment for a tram network. Over the next few years and in discussions with Sir Paul Chater, then an Executive Councillor, Dickinson was keen to develop a scheme. Thus, in January, 1904 Dickinson wrote to the Colonial Office expressing his interest in developing a tram system for Kowloon. In the end, the link to Sam-chun was provided by a steam railway, the Kowloon-Canton Railway opening in 1910, but planning for a Kowloon tram line continued. With the successful operation of the Island tram lines, The Hong Kong Tramway Company made a number of proposals to the Government for Kowloon, hoping to be awarded a fanchise to operate a tram system in Kowloon. 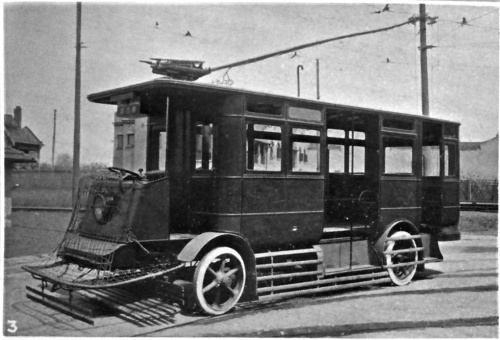 On the 1st October, 1913 the company had written to the Government outlining the idea of initially providing a motor bus service in Kowloon which would then be replaced with a rail-less car [trolley bus] or tram services, as demand grew. However, Government was non-committal about the proposal. The Hong Kong Tramway Company wrote again to the Government on the 17th April, 1914 on the subject of extensions, again with no positive response. Despite the official indifference, the Hong Kong Tramway Company wrote to the Government on the 1st March, 1916 making a formal request to commence a motor bus service pending the construction of a trolley bus or tramway system. It was recognised that the roads in Kowloon were not strong enough for this kind of traffic and would need to be strengthened by the Government. They proposed three routes and suggested levying for each vehicle mile to help with the road upgrading cost, amounting to $3,600 per annum for the initial system [1916 prices]. A Cross Route from Hung Hom to Sham Shui Po. 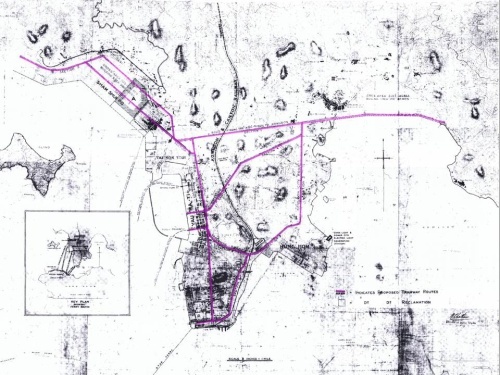 Options were proposed to extend the Mong Kok route to Lai Chi Kok, the Kowloon City route into the Kowloon City reclamation, and to introduce a second cross route from Lai Chi Kok to Kowloon City. Again, the Government remained non-committal and privately considered the cost of road upgrading to be too great. In an attempt to allay the concerns regarding the cost of the road upgrades the company wrote to the Government on the 2nd July, 1918, with a proposal to construct a tramway sitting on its own concrete foundation, thus avoiding the need to strengthen the roads and the payment of the upgrade levy. The Government responded that they were not prepared at the time to consider such a concession, suggesting that Kowloon was not yet ready for a tram system. 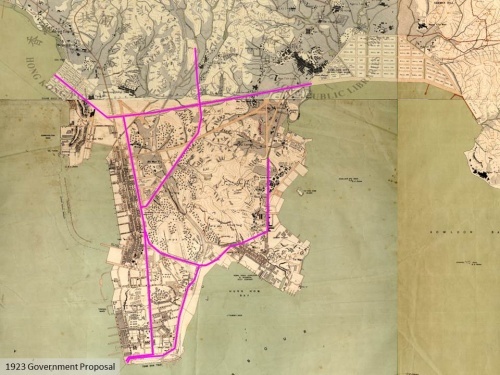 Thus, it came as a surprise when in March 1919, less than nine months later, the Governor, Claud Severn, (acting administrator), wrote to the Colonial Office proposing to build an extensive tram network in Kowloon, including the plan shown below. He noted the previous discussions with the Hong Kong Tramway Company but considered their proposals were not worthy of consideration. His objection, shared with much of the Hong Kong public was that when the private companies provide public services, “where the interests of shareholders have to be considered the public suffers”. He noted that both the tramway and Star Ferry Company were now “reaping large profits with no advantage to the public”. Citing the China and Japan Telephone Company, who had a monopoly on Hong Kong telephones but was regulated by Government with regard to charges levied, he wrote, “I am strongly opposed to perpetuating in the Kowloon peninsular the system of private monopolies for public services that exists in Victoria”. Rather, the Government proposed it would build an extensive tram network for the peninsular which would be operated by the Railway Department then the operator of the Kowloon-Canton Railway (British Sections). At the Hong Kong Tramway Company Annual General Meeting of 1919 the Chairman, the Honourable Mr D. Landale noted “we consider that a tramway would be provided on more favourable terms to the community than if laid by the Government or by a separate concern and could be worked more economically under one administration”. He also suggested that with its other commitments, the Government may be too short of funds to undertake such an enterprise. In the “Development of Public Transport in Hong Kong” there is a description of the tram line from The China Mail. which is consistent with the Government 1919 proposal. To date attempts to source the original reference have been unsuccessful. 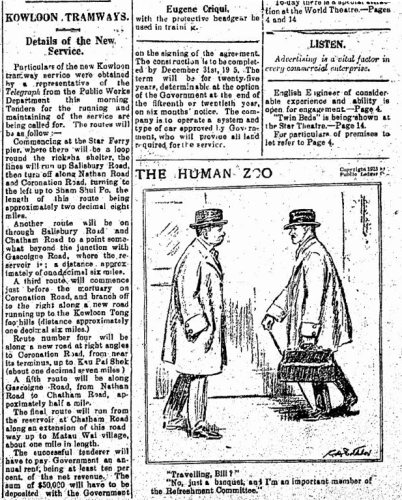 Little progress was made with the tram proposal and in 1921, with the a new Governor, Sir Reginald Edward Stubbs, the Government advertised for Motor Bus services for Kowloon. Tenderers requested subsidies to operate the prescribed service for a fairer strategy. There were no suitable tenders and the bus scheme was abandoned. In 1922, the China Mail reported that the Kowloon tram system was progressing and the Government would initially build 12km of track, to be expanded up to 50km as Kowloon developed. In July, 1923 details of the six routes were published along with the news that the operator of the tram network would be awarded through a tender process. On the 27th July, 1923 the Government published the tender for operating the Kowloon tram service and HK Trams submitted an operating proposal, some ten years after first raising the proposal. By the summer of 1924, the Government had decided to re-think their approach and announced that a committee would be formed to review the transport strategy for Kowloon. In the following year, 1925 as reported at the HK Tramway extraordinary meeting, the Government had abandoned the idea of trams and would be calling tenders for the exclusive right to operate a “motor omnibus” service. It was not until the 2nd September, 1932 that the “Tender for Road Passenger Transport” was issued for the provision of bus services throughout the Colony, commencing on the 11th June, 1933 for a term of fifteen years. This was ultimately awarded to two new companies, China Motor Bus Company for Hong Kong Island and Kowloon Motor Bus Company covering Kowloon, the first franchised bus operators. Many factors influenced the Government in not building the Kowloon Tram system, from the capital cost and poor state of the Government coffers, to a distrust of monopolistic operators, but in the end it was probably the advances in transport technology that made the motor bus a viable option at no cost to the administration. 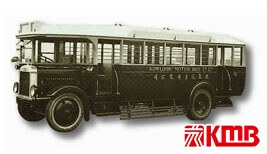 With the award of the franchise bus service in 1933 the era of the bus as primary means of public transport commenced. It would be nearly 50 years before a new rail based transportation system was commissioned with the opening of the first MTR line 1979. This article was first posted on 12th January 2016.